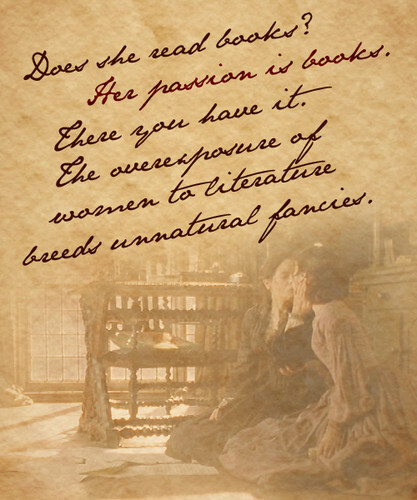 "The overexposure of women to literature breeds unnatural fancies.". Quote from "Fingersmith" 由 Sarah Waters, featuring Elaine Cassidy as Maud Lillly and Sally Hawkins as Sue Trinder in the 2005 miniseries.. Wallpaper and background images in the 值得一读的书 club tagged: photo books reading literature women fingersmith sarah waters maud lilly sue trinder fan art. This 值得一读的书 fan art contains 标志, 海报, 文字, 黑板, and 文本. There might also be 报纸, 纸张, 杂志, 小报, 抹布, and 纸.